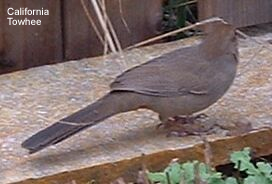 Towhees are brownish-colored sparrows found in North America. They can be distinguished from the typical sparrows by their long tails. These omnivorous birds are often observed foraging on the ground using both feet in unison to scratch lose ground debris to reveal food hidden underneath. Excepting some local movements in response to availability of food, towhees are mostly sedentary (non-migratory), the exception being the Green-tailed Towhees - the only entirely migratory towhee species.